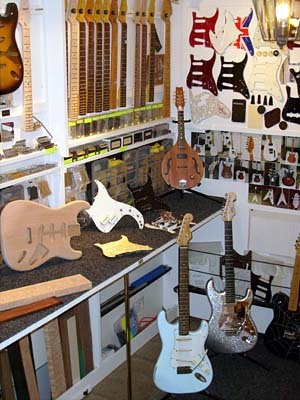 Andy Farrell is an independent time served luthier specialising in guitar repair and maintenance, having worked alongside hobbyist and professional guitarists for over 40 years. Catering for guitarists needs from a players perspective, offering an attractive trade level pricing policy direct to the public, WHY PAY MORE ! Not to be confused with often expensive high street services carried out by in house amateurs claiming to be trained luthiers. I do not stock or retail musical equipment therefore I am not a shop, all work is carried out exclusively by myself, I do not employ outworkers or third parties of any kind, nor do I post spoof reviews of my work in order to boost internet ratings, I have no affiliations with retailers, private individuals only. As of January 2018 I no longer produce hand made Instruments, Guitar necks, plastic pick-guards, apply sprayed paint, repair or install active electronics, Re - fret guitars, or replace lacquered in Top nuts on guitars without a good reason. I will continue to offer basic passive electrical repairs and installations, Repair clean headstock breaks, and offer light restoration work where necessary including hardware upgrades etc. I ACCEPT ONE ADULT PERSON ONLY INTO MY WORKSHOP PER APPOINTMENT WITH NO EXCEPTIONS. Please be aware that operator monitored digital audio and visual surveillance equipment is active at all times inside and outside my premises, all data and images generated are erased on a daily basis to protect customer privacy. Rainbow 1 leaves Nottingham Victoria bus station every 10 minutes, about 25 minutes to Kimberley. Directions to my workshop are available at GOOGLE guitar repairs Nottingham.